Electronic Commerce is a business model that allows the buying and selling of products or services over the internet. Nowadays, businesses use technology to handle customer service in a more efficient and cost-effective manner. There’s no denying the fact that the quality of your customer service plays a major role in determining whether or not you build customer loyalty to your brand. Now more than ever before, customers have a wide range of alternatives. Offering quality products and services and remaining responsive to their queries helps you gain a competitive advantage. Losing a customer because you did not treat them right or create a good relationship with them can prove expensive for any business. Any entrepreneur who is serious about expanding their business should focus on understanding why customer service is very important. i. Helps with customer retentions and as you already know, the probability of the existing customers buying from you is higher than new customers. ii. Word-of-mouth advertising from your already existing customers will bring you new customers. In the end, this translates to more profits. iii. Excellent customer care strengthens your brand and this results in a positive reputation. iv. By paying homage to your customers, there will be a reduction in overall problems especially legal issues. v. Generally, good customer care elongates the lifespan of your business. When customer needs are ignored, there is increased risk of business failure. The goal of any business is to generate customer loyalty through value­ adding interactions. The advancements in technology have made it significantly easy for online businesses to provide customer service. In addition, the tools have been simplified making the interactions very user-friendly. More and more e­commerce businesses are providing their customers with tools that enable the customers to make a good purchase. These tools improve the customer experience and foster an environment for the future success of your business. This tool provides businesses with a means of interacting with their customers, gathering sales leads, a better understanding of customer behavior, and providing better customer service. Live chat offers a live chat option where you can foster an improved customer experience. The customers interact with your sales or support team on a dynamic chatbox and ask whatever questions they have directly to your company representative. This is also another way to provide the customer with useful information that could potentially encourage a buying decision. The live chat software is really flexible and it allows you to engage your website visitors by sending customized messages. Engaging the right prospects in real-time conversations has high conversion rates. Live Chat is, also, a great way of gaining access to invaluable information about the state of your business. When visitors come to your website, they click on your live chat widget in order to start a conversation with you. This avenue can either be used to handle sales or support related issues. Since live chat gives you the ability to see everyone who visits your website, it can be used a lead generation tool. When they initiate a conversation, the customer is required to enter their personal details. This information is later on used for email marketing. The Zendesk business integration solution gives you the ability to automate chats and initiate chats with customers even before they get to ask you a question. 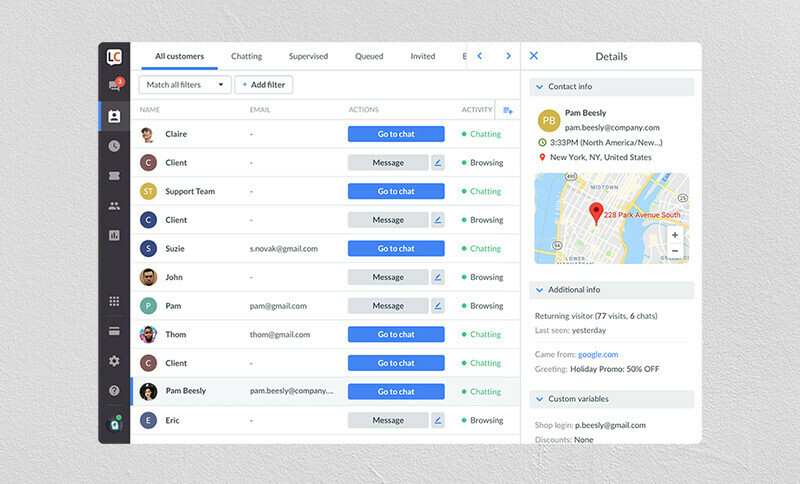 This tool makes it very easy for your team to talk to customers and solve their problems in real-time. Access to incoming tickets is also made very easy for your support team. Sometimes, one can get overwhelmed with backlogged tickets and disorganized files when running an online business. The multitasking capabilities make it possible for the team to work on multiple tickets to minimize backlogging. Zendesk Chat offers online messaging capabilities and also supports voice and live chat. Basically, it offers, right at your fingertips, every customer service you will ever need. 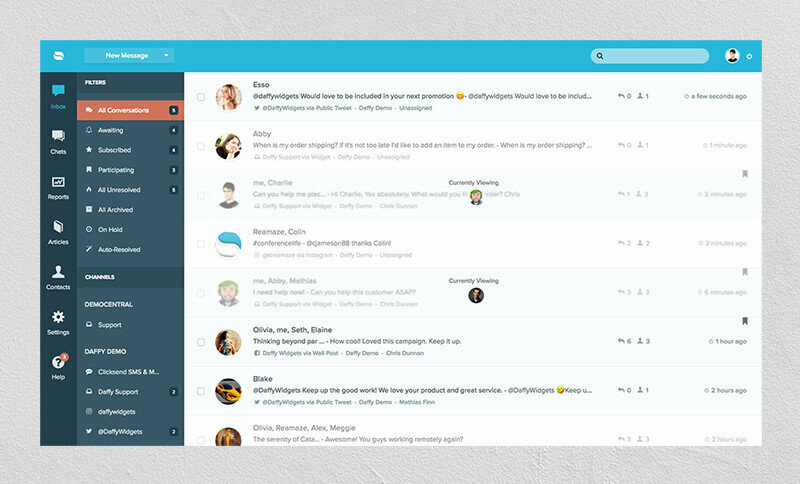 This tool also offers organization capabilities whereby important emails that require instant responses are highlighted. Zendesk’s analytical capability helps identify any slow response time and troubleshoots to help you fix the problem. 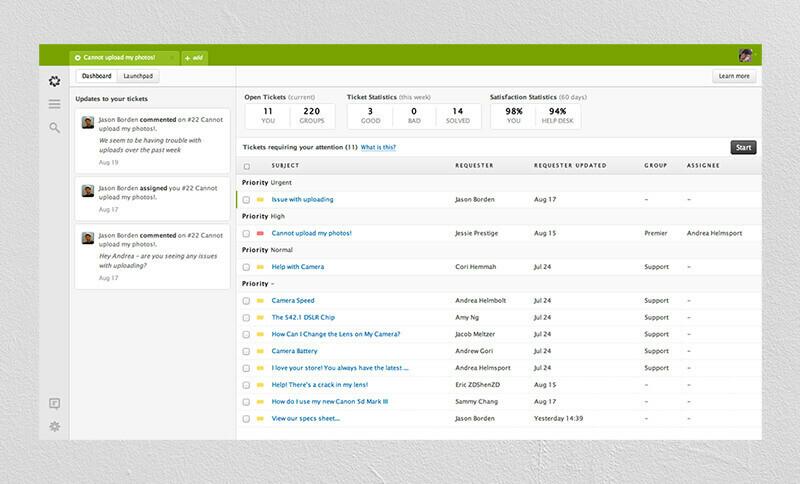 Finally, Zendesk aids in the tracking and monitoring of visitors who come to your website. By simply browsing the dashboard you can get an idea of the people who need your help. The Re:amaze platform is a help-desk and customer messaging tool that is designed for e­commerce businesses; it was created in 2012. Re:amaze makes it possible for customers and the support team to hold conversations in different channels such as emails, mobile SMS, social media as well as on live chat. It offers these through the shared inbox and the real-time messaging platform respectively. The sales and marketing department is taken care of by the live dashboard that tracks the activities of online customers. This tool also offers the FAQ feature which is necessary for any good helpdesk. This feature helps your business to create and organize important content. Integrating Re:amaze into your business is a big deal. It offers a great opportunity for growth and is the cornerstone of having a good customer service culture in your business. Not only does the integration make things super easy for you but it also gives the customers a seamless and intuitive experience. When either your company representative or the customer is typing a response, an alert comes up to notify the recipient that a message is being typed. All this while, a persistent indicator appears to show that the conversation is Live. There is an “End Chat” button that the customer can use to end the chat. 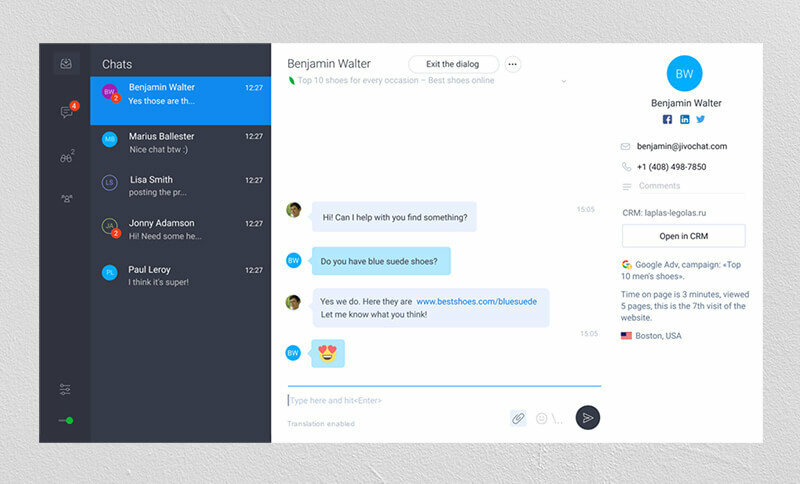 Re:amaze is, in a nutshell, the perfect help-desk and customer messaging platform. This is because it effectively takes the place of all the other tools that businesses might need to communicate with their customers. JivoChat enables you to hold real-time conversations with your customers on Facebook, Telegram, Viber, Email, on phone, as well as on your website. It is a very helpful tool for creating leads. Compared to other customer service tools, this is really affordable since it can be installed for free; this makes it suitable for small to medium-sized businesses and startups. JivoChat also allows you to make instant callbacks and works on devices like Mac, Android, Windows, iPhone, and Browser. 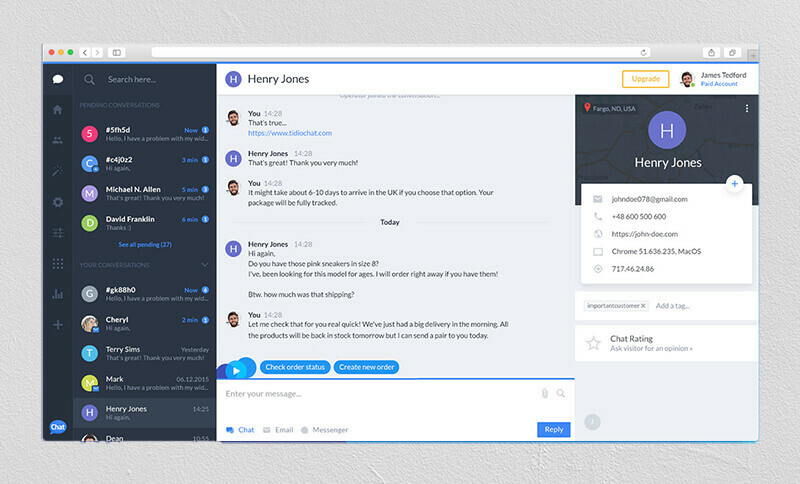 Tidio is a web-based live chat tool that collects messages from your website’s chat widgets and Facebook into one interface. What makes Tidio special is its modern design that suits any business, Android & iOS apps, as well as full mobile support. It also comes with a live preview of what the customer is writing before sending their message, and powerful automation, which allows you to cover thousands of automated scenarios for your e-commerce store.